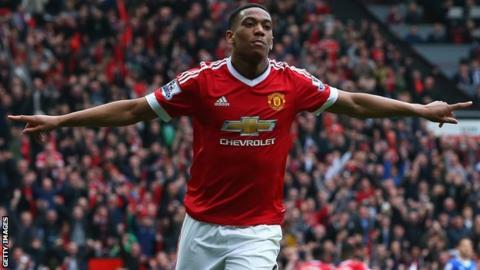 Anthony Martial's winning goal kept Manchester United in the chase for a Champions League place on the day they named a stand after Sir Bobby Charlton. Martial turned in Tim Fosu-Mensah's cross from close range early in the second half to send Everton to a third straight Premier League defeat. Phil Jagielka headed against the bar for the visitors, and later had a snapshot saved by David De Gea. Victory leaves United one point behind fourth-placed Manchester City. Manchester United's modern-day young players combined to set up victory on a day when the club honoured as great a home-grown talent as they have ever had. Before kick-off, the South Stand was renamed after Sir Bobby Charlton, the Busby Babe who won the 1966 World Cup with England, and who remains United's record goalscorer. Accompanied by his wife Norma, a visibly emotional Charlton watched from the pitch before kick-off as fans held up sheets to spell out his name. The United team of 2016 follows strongly in the club's tradition of blooding young players - three of which were involved in the goal that provided a breakthrough after a turgid first half. Marcus Rashford has been a revelation since breaking into the United team in February; scoring four times in his first two appearances and hitting the winner at Manchester City two weeks ago. This time, his backheel freed fellow academy graduate Fosu-Mensah to play a low ball across goal, which 20-year-old Martial - signed from Monaco for an initial fee of £36m in September - touched in at the far post. From his seat in the stand, Charlton applauded warmly, a smile breaking across his face. The result will have been pleasing for Charlton, but this was a far from fluent United performance in a largely forgettable match. For the 10th time in the Premier League this season, a first half at Old Trafford ended goalless, and there was not a single shot on target in the opening 45 minutes. Everton just shaded that first half, with Marcos Rojo struggling at left-back against the pace of Everton winger Gerard Deulofeu. United improved after taking the lead, but were never entirely comfortable and - in addition to Jagielka's two near-misses - escaped when the classy Fosu-Mensah made a brilliant clearance almost underneath his own bar to clear Seamus Coleman's low cross. However, it was a second successive 1-0 victory for manager Louis van Gaal, which keeps his team firmly in contention to qualify for next season's Champions League. It was a mixed afternoon for Everton defender John Stones, making only his second club start since late January as he attempts to ride through the trickiest spell of his young career to date. A target for Chelsea last summer, Stones has had to watch on for much of the last two months as Ramiro Funes Mori has partnered Jagielka at centre-back. Stones has been criticised for errors made when trying to play out from the back; the latest of which came with England on Tuesday, as a slip allowed the Netherlands to begin the move from which they earned a penalty in a 2-1 win. The 21-year-old showed he still has plenty of confidence on the ball, and made a superbly-timed challenge to deny Martial in the first half. However, he was at fault for United's winner, as both he and Coleman switched off to allow Martial space at the far post, and Everton fell to only their second away league defeat of the season. Everton manager Roberto Martinez: "There were two games within a game. Up until the goal, we were the team with a better tempo and we always looked a threat. "The goal was a very soft action, it's not up to our standards. The performances were very, very level and we shouldn't have lost the game. It's that sort of game that came down to small margins - the ball hitting the crossbar is the difference between us getting something out of the game. "We are a young group with great potential, but our home form hasn't been anywhere near good enough." Manchester United have become the first team to score 1,000 Premier League goals at home. The first was scored by Denis Irwin in a 1-1 draw against Ipswich Town in August 1992. But the first Premier League goal for anybody at Old Trafford was scored by Everton - through Peter Beardsley in a 3-0 victory. Ten of United's 15 Premier League games at Old Trafford this season have been goalless at half-time. Everton have suffered 200 defeats away from home in the Premier League. United have recorded four successive home wins for the first time since April 2015 (when they won six in a row). Manchester United travel to second-placed Tottenham in the Premier League next Sunday before an FA Cup quarter-final replay at West Ham three days later. Everton face a league trip to Watford next Saturday, and then to Crystal Palace the following Wednesday. Match ends, Manchester United 1, Everton 0. Second Half ends, Manchester United 1, Everton 0. Attempt blocked. Juan Mata (Manchester United) left footed shot from outside the box is blocked. Assisted by Antonio Valencia. Attempt saved. Marcus Rashford (Manchester United) left footed shot from the right side of the box is saved in the bottom right corner. Assisted by Anthony Martial. Substitution, Everton. Oumar Niasse replaces Ross Barkley. Hand ball by Romelu Lukaku (Everton). Attempt blocked. Tom Cleverley (Everton) right footed shot from the centre of the box is blocked. Assisted by Leighton Baines. Attempt saved. Phil Jagielka (Everton) right footed shot from the centre of the box is saved in the centre of the goal. Corner, Everton. Conceded by Antonio Valencia. Substitution, Manchester United. Antonio Valencia replaces Daley Blind because of an injury. Delay in match Daley Blind (Manchester United) because of an injury. Offside, Manchester United. Juan Mata tries a through ball, but Marcus Rashford is caught offside. Offside, Everton. Kevin Mirallas tries a through ball, but Seamus Coleman is caught offside. Offside, Manchester United. David de Gea tries a through ball, but Jesse Lingard is caught offside. Attempt blocked. Kevin Mirallas (Everton) right footed shot from the right side of the box is blocked. Assisted by Aaron Lennon. Substitution, Everton. Kevin Mirallas replaces Gerard Deulofeu because of an injury. Substitution, Manchester United. Ander Herrera replaces Michael Carrick.